Filmwig is a sound library for Bitwig Studio. This library is aimed to those seeking quality sounds for scoring, to experiment with electronic music and in every situation that requires an injection of twisted and powerful vibrations. Filmwig features 80 machines made up using Bitwig Studio internal devices. Each snapshot is not a preset, but a complex chain of instruments and effects crafted with real-world music production in mind. All this complexity can be easily controlled with the eight macro controls, able to transform a sound into a totally different one. For those who dig deeper into sound design, all the parameters of each device can be obviously modified and automated. Inside Filmwig you will find both instruments and effects: the former featuring drum machines, pads, percussions, drones, basses, sampled instruments and many more, the latter able to turn every sound or recording, even the most simple one, into an intricate soundscape, a powerful percussion or anything else you desire. The possibilities are truly endless. Those who need ready to use yet tweakable sounds for their soundtracks will find in Filmwig their best ally. Reverse tensions, cinematic percussions, epic pads, modern electronic sounds, sound sculpting effects: these are just some examples of what you will have at your fingertips. 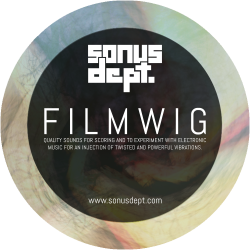 And not only soundtrack composers will find Filmwig a pleasure to play with: from the experimental electronic musician to the more traditional one looking for some different ideas and influences, everyone will find the sound they are looking for. You need Bitwig Studio version 1.2 or higher to use this library.